We are right within a very powerful conjunction of the planets and the moon phases so this week is going to take each of us into a new and powerful cycle of our lives. Wesak is upon us which is always a very accelerating time but then we are gifted with a Lunar Eclipse with the Full Moon on May 25th at 9:25 AM Pacific US, 4:25 PM GMT. The energies this week represent the balance between the lower mind and higher mind which is in alignment with Wesak. This year’s theme of the Wesak energies is “The Three Fold Flame of GAIA” as she will be balancing her mental and feminine aspects of Will, Love, and Power. This will mirror unto each of us to go deeper into our own soul’s essence to allow the energies to enfold within us. It is time to fully command the Higher Essence of our Divine Self to become manifest into our physical realities. We have been preparing for this energy since the beginning of this year as it represents Synchronization. This is not an easy process as we have to get very real with our feelings and thoughts so that they are transmuted into the pure essence that We Are. Many of us don’t understand what that can feel like as it has never occurred upon this Earth previously in such mass consciousness. Every individual person is feeling something different about themselves in order for them to awaken to their Truest Self. The individuals that do not do so will go deeper into their duality of the dark and light within as the Light cannot shine brightly without the essence of integrating into all parts of the Self. The fourth dimension represents that duality and this is exactly what we have been experiencing in our lives and in our world. It takes great courage and understanding to continue deeper into the self realization of Divine Light enfolding within the physical structure. We will learn through the ensuring energies around us that we are thinking and acting differently. We want to feel the serenity and joy we deserve with a greater capacity to accept an abundant life in all areas of our life. This is exactly what we can accomplish at this time. The power of Gemini versus Sagittarius will challenge us in the realms of being in the moment against wanting to forge ahead. If we take these two energies and combine them in the same essence, then we can do both. Action needs to preceded by meditative thoughts and not necessarily stepping ahead before all the elements have been put into place. If we understand these energies from this perspective, then we are working through our Higher Mind being integrated into the Lower Mind. No parts of the self will be lost as there will be a blending effect that occurs. So take the time to acknowledge your Higher Self blending within the Lower Self and you will understand what it means to acknowledge your own Three-Fold Flame of Will, Love, and Power. As the Wesak energies have been preparing us for these steps, our Higher Self comes into our full Beingness. As trainees on the Mastery Pathway, we go through many levels of initiations that help us walk through new doorways of reality. Wesak is the most powerful spiritual ceremony of the year as we follow Lord Buddha in his footsteps of accelerating our teachings of being an Ascended Master or Being upon the Earth. We celebrate Lord Buddha’s ascension but that mirrors right back to us as we proclaim within ourselves the next step of our spiritual evolution within the physical existence. So we will change through the process; even if you are not fully aware of your pathway of light upon this Earth. This process is becoming stronger each month throughout each year. We will move into the 5th dimensional physical reality but it takes hard work and diligence to not fall back into our old habits. This is a perfect time to look at your traits and see what fits your reality now versus to what was for you before. The power of this week cannot be put into words. It can only be acknowledged through each person’s reality and what they are going to experience. But believe me, whatever you intend the God Force will hear you because it is our destiny to walk as enlightened beings into the New Earth of Terra Christa. GAIA will assist us and in turn, we will assist her in this process. We are living in a spiritual revolution where individuals are finally turning to their highest essence for answers. This is the power of our Light into our physical reality. So take some time and understand what you are going through. Then call upon your guidance, Higher Self, and I AM Presence to guide you in the right direction. It is a beautiful week, and we are happy to convey this message to each of you. The birth of a New You is about to begin, and we want to offer a celebratory message for you. 2013 has been the most crucial and challenging year upon the history of this planet. There have been moments of great darkness and despair as well as experiencing the highest level of vibrational exchanges available upon the planet. That is the beauty of this time as we all need to reflect deeply on our humble beginnings to find our humble expressions of a soul that has traveled many lifetimes through timelines that would only be reflected in a science fiction movie. You have experienced many facets of your lives in a way that has been ordained from the essence of only the I AM Presence can give. There is no reason or understanding of what you have endured but only that it is part of the journey. Reflection has been a word that we have used consistently throughout this year and that is not going to change. It is an important factor to remember when we are acknowledging our true self to become manifest. We must compare what we are feeling to what we felt in the past. It helps each of us to be molded into the present moment so that there are no repeats of the energy or situations in the future moments. Each of us is molding our present from the experiences of our past to embrace our future. We speak in these tones of the “we” at this time because this is not a lesson, but truly, a Circle of Oneness. What each of you experience, we endure. Wesak represents the time of community when like-minded souls come together to celebrate their challenges and accomplishments to prepare for more of the same. As a master-in-training, you must realize that is what you are experiencing. Life cannot be created within Oneness without first looking back and realizing what the previous moments have meant to a great master. It is part of the training to understand the process of hurting, healing, and embracing the pathway. This Wesak is especially important due to the year of 2013 but also with the powerful eclipses that the planet has experienced. The Lunar Eclipse of this month will be a culmination of the energies just as Wesak represents each of us coming together in celebration. It is a time of complete integration of the Masculine and Feminine Divine. We know that we have shared about these energies before but it goes to a much deeper level as we experience each new vibrational change in the planetary structure. It is now time to reflect into whom we have become and what we are going to do with the changes that have resulted from the situations that we have encountered. If we understand the fact that in order to move forward, we need to understand what we are experiencing presently, then it becomes a flowing movement. There is no need to worry or be concerned with what is occurring. We learn to move forward from each moment to the next. It is the Ebb and Flow of Life. When this comes from the perspective of the Mastery, there is no question in what you are experiencing. It is all part of the process of living within these energies of fluidness. It is beauty and reflection at its best creation. We are all being borne once again in the ebb and flow. As Lord Buddha releases his old aspects from the previous year, he moves to a new position within his power. Each of you is doing the same, and We, of the ascended beings of Light, are also participating. Wesak is not just about the physical form. We, within the Unified Whole, have just walked into Oneness by removing our old Pantheons of our pasts. We utilize the knowledge of those past creations, but we do not center upon them. We are honored to walk with each of you at this time. It is our Creation Upon this Earth together, and it is our Divine Pleasure to walk with each of you. Be strong in your convictions and intentions; the power of the energy presently will allow you to grow deeper and create your lives to be in complete harmony with joy and compassion as your guideposts. Experience this event as your re-birthing process into your new world of creation. We re-create each Wesak and now is the time for you to join us in the manifestation of a New World with Love, Joy, Responsibility, and deep conviction for the Light that You and We Are. Blessings and Joy for a beautiful Wesak experience. We are One with each of you in this moment and all moments forward. The Unified Whole Command representing the Oneness Consciousness of the All. Walking Terra Christa is holding a special Wesak Ceremony in Mt. Shasta; individuals may request that their name and location be put on our altar for the celebration. Please email us at MelandMike @ Walking Terra Christa.com to be added to the group consciousness. We are also providing an MP3 file for the recorded meditations both morning and afternoon; details are available on our event, http://walkingterrachrista.com/wesak-ceremony/ (individuals in our Membership Program will have access to these recordings). ©2013 Walking Terra Christa Academy of New Earth Mastery, http://walkingterrachrista.com, Rev. Christine Meleriessee & Mike Hayden, 5th Dimensional Mastery ~ All Rights Reserved. Lord Sanat Kumara is an amazing gentle, wise, and powerful ascended master who many love and honor. This week in the Clarion Temple of Oneness we honor him as he shares his thoughts of the upcoming Wesak energies. Sanat Kumara is considered to hold many roles in our spiritual history. He is known as the Lord of the World, Father of Spirituality or Humanity, and Founder of the Great White Light of Brotherhood. Whatever title that he is given he is still the most genuine spirit that an individual can connect with for their spiritual pathway of mastery. He is the leader of the Venusian Flames and the Flame Holder for the Violet Flame. His is originally from Venus and worked as the Planetary Logos for several thousands of years. He was the Silent Watcher of the Goddesses from Lemuria which was when he started the Brotherhood of White Light so as to keep the secrets of the Goddesses from being revealed. This was when Lemuria was at war with Atlantis which eventually was the downfall of both continents. His post as the Planetary Logos was taken over by Lord Buddha in the 1950’s, but he played a very active role within the humanity of Gaia and all her inhabitants until the New Millennium. It was at this time that he went back to Venus to prepare for the New Earth. He is now very active to assist lightworkers on the pathway of Mastery in preparation for leadership roles that will be activated on the 5th dimensional frequency known as Terra Christa. (If you would like to learn more about the Venusian Rays of God, please see our special online program, “Venus Meets Gaia for Terra Christa”.) His work with the Goddesses is unprecedented and is available to every initiate to fully accept their role upon the New Earth. His role during the Wesak energies is to hold the light as Lord Buddha descends into Shamballa to receive his next initiation. He holds this frequency with Lord Maitreya (Office of the Christ) along with the entire Spiritual Hierarchy, and God Force. It is my pleasure to connect with each of you for this energy transmission. Whew, we have come a long way together. Centuries of blood-fearing energies being dissipated at the same time to allow for the entrance of light that is way beyond what you have ever experienced from Lemuria and Atlantis. Thank you, God, for those times to be gone out of our consciousness. I just ask you one question. Do you feel you have removed all elements from these timelines to find your true purpose? This is very important as the Wesak energies in 2013 are going to surpass any others that we have experienced. We cannot measure the depths of the frequency or the changes that you will be able to feel just by explaining it to you in words. It has to be felt by each of you individually to fully allow the consciousness of your Higher Self and I AM Presence to be felt through the entire experience. Otherwise, you will not be fully prepared to have the most exquisite moments of your soul’s life to be shown to you in the physical creation. Some individuals may think that Wesak is just another spiritual holiday and in a sense, it is. But it is quite different if you fully allow your consciousness to participate in the energies. Preparations are being made presently to allow all souls in humanity to understand the depth of their own origin and to receive the highest form of acceleration within their physical world. Each of us within the Spiritual Hierarchy work especially hard to allow this moment to occur for humanity but it is up to each of you individually to full integrate its essence. It is important to take your personal inventory of the last year. What have you been doing, feeling, and experiencing within your pathway? This is of a personal and professional nature. Those of you that are in the healing, coaching, counseling, and sharing with others your knowledge need to listen intently. You will change if you allow it to be. But you must not think it is going to happen automatically just be asking it to be. What work have you done for yourself and have you seen improvements throughout the year? Have you fallen behind once or twice? This is imperative because you need to understand the lesson in each movement either forwards or backwards so that you don’t allow the pitfalls of the experience to affect you again. These are all part of the learning experiences and will help you to mold your future. Take a look to see what you have accomplished, if it has been to your highest desire, and what could you have done to make it a better experience for yourself. These are all important aspects to consider when stepping into another level of your initiations. The more you accept about who you have been, the more you will aspire to deeper levels within yourself. So as you can see Wesak represents the ability to look within, be truthful and honor who you are even in times of not liking what you experienced. They, in truth, are the most powerful moments in your pathway. They will help you to mold a new essence that is trying to emerge from the depths of your soul. But you must be honest within and know when something does not feel right as the transition occurs. You see, your Higher Self is expanding within you deeper within each moment and it allows you to not only understand the process of your transformation but to accept it within all parts of your existence as you become fully integrated of the Light and Power that you are. You can expect major growth changes within you as long as you look in the mirror in front of you, remove what does not fit the new essence, and accept the existence of your world changing from your soul’s perspective and not the physical mind. This is what Wesak is going to do for each of us by allowing us to go deeper into our experience with the Higher Self and I AM Presence. We are all excited to be part of the ceremonies with each of you. It is our time to fully come together and co-create all aspects of the self within the embodiment that You Are. I deeply honor each of you and so many ways. I Am Lord Sanat Kumara at your service. Walking Terra Christa is holding a public ceremony in Mt. Shasta for the Wesak energies. We are also recording the morning and afternoon meditation. You may order these MP3 downloads on our website, http://walkingterrachrista.com/wesak-ceremony/. Additionally, if you cannot attend, and want to be part of the energies, please submit your name and location to MelandMike@WalkingTerraChrista . com to have your name put on our Altar. Lord Sanat Kumara will be our guest speaker in the Clarion Temple of Oneness on May 13th, 2013 at 5 PM Pacific, 12 Midnight GMT. If you would like to join this live call, you may do so on a call-by-call basis without joining the Membership Program. For details, http://walkingterrachrista.com/tele-calls/. Challenge is the buzz word for 2013 and this month it becomes increasing more powerful. We have been guided by the God Force that this year would represent “synchronization” and that if we did not let go of the old forces within us that it would push us into a new way of existing whether we were ready to go into that phase or not. We did not do a Frequency Update last week as the energy was in a stillness and I could not find the right words to explain what was occurring. In addition the Unified Whole Command asked me to take a back seat in sharing any energies. I think sometimes we just need to flow with what we have received in order for the next phase to occur. This is the stage that we are experiencing presently. As of Thursday, May 9th, at 5:29 PM Pacific, US time, 12:29 AM GMT, we experienced a New Moon with a Solar Eclipse. I always love the essence of the new moon energies as they represent new beginnings. I have never been one that stays stagnant very long which has allowed me to flow within my pathway as it changed continuously. This week we are no longer staying idle and moving into another direction that is guided by our higher self and the journey that we have chosen to create. This moon represents a testing period. We have gone through the resurrection phase of the Festival of the Christ and are now moving towards the Wesak energies in which we arise to a new level of existence. But before we can do that we must stop and take inventory of what we want to bring along for the ride or remove it out of our soul’s personality and consciousness so that we never have to experience it again. We are being guided to make choices about our existence upon this earth and our inner ability to achieve the highest focus of life upon this planet. This will represent our friends, family, interactions personally and on the computer and how they directly affect our well-being. What is your focus for your life presently and how can you make it better so that your higher self is guiding you through your physical existence? These are very important questions because we are living in a very powerful state of being upon this planet. GAIA is accelerating and we must move with her or decide this is not the place for us to inhabit. So the testing ground will be set for each individual on the level that they are able to understand. Many individuals may just see themselves changing a job or residential location. Others are making life-changing alterations to assist themselves in living happier and content lives. But, the lightworkers are going to be challenged to be their best, to walk into their pathways on a deeper level, and make a strong commitment to the world in a way they may not understand. The ascended masters call this responsibility of the master and it is an important part of accepting our Higher Self intertwined within the physical body to create the full body system. So if you are being challenged to create these changes, then it is your time to shine. Challenges always represent doorways for growth and opportunity. They are not easy but a necessary part of existence within the world of mastery. This Solar Eclipse will create opportunities for advancement as a soul on this planet and prepare each individual to move further in their chosen pathway. 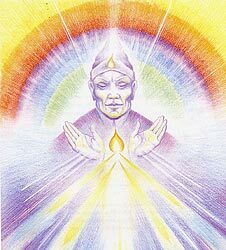 A doorway is being filled with the Light of the Truth to enable initiates to deepen their ability to access new avenues of knowledge and expertise to be shared with others in this world. The full moon is when we will be acknowledged for walking through the doorway of light and help to accelerate our livelihood in a new and different manner than we have experienced previously. My advice to any individual that wants to go further into the depths of their essence is to call upon their guidance and higher self to assist them to step into the doorway of accessibility. The Wesak moon will prove to be the turning point for many individuals to fully accept the next stage of their growth. Take some time to reflect on the Solar Eclipse and New Moon on the 9th, 10th, and 11th to fully allow the next stage of your soul’s essence to be embodied within you. It will prepare you for the next stage of growth. We speak to you on this day of the Solar Eclipse and want to assure each of you that the light of your essence will shine deeply on this day. We understand that you would like to see elements change immediately in front of your eyes but let us start with just one small miracle of your life. A doorway has truly opened on this day and it is up to each and every one of you to understand what this opening of a new truth may mean for you and your existence. It is different for each person and not everyone will truly step into a world full of miraculous beauty. But it is possible today. The New Moon is always a time of deep growth and awakening so it is with this transmission with open up new avenues of particles of light to shine into your heart. You see, we want to know that you deeply understand the trials of the pathways that you have chosen. No one has ever existed in this way as you are doing so in these moments of creation on GAIA. That is why it may seem insurmountable of what you want to achieve, but yet you are achieving it every moment you breathe the essence of your Divine Being as it becomes manifested within your existence. We speak of the eloquence of the light in words that do not really understand one another, but yet it is the fluidness of the expression that you are experiencing. If we were to stand in front of you in this moment we could not show you the tangible elements that will make it seem real. It must come from your reality of light that you are into the physical being that you are inhabiting. Magic is upon us and now is the time to acknowledge the miracle of life and not look towards something that cannot exist for you without the realization of IMAGINATION. In truth this means that the childlike attitude of being in a world of magic is truly the way that you need to acknowledge the growth that you are experiencing in your life. If you look around you, the world is not doing as well as taking a breath of your own essence which combined with the energies around you make it quite magical. The reality is understanding how to create your own existence upon this planet. It cannot be done without allowing all parts of yourself to experience the essence of your soul’s existence. If you think about it, this essence represents the soul’s birthing process of many souls existing at the same time within harmony of the self. There was great joy and expression of light and laughter within each moment. Your heart desires to feel this once again. So you have a special opportunity of allowing it to be so. You see, if you don’t imagine that it is occurring then it cannot occur. It must be a heart-felt message within yourself to create the dynamics of mystical thoughts and occurrences to come into your world. The more that each of you practice this exercise of the light within your world, it will become the light. The more you practice doubt, then that will be the resultant energies within your life. The doorway is now open for a three-day period to create the existence of your life in the way that you always wanted it to be. If you allow yourself to be in a dream world of existence of all that you love and enjoy, then you can create the energies to become manifest within you. You have at your disposal at this moment in time the ability to be the alchemist and have your wildest dreams to come to fruition. That is the beauty of this new moon and what she is showing you in your experiences. Be the child and step into this world with great laughter and enjoyment no matter what your present circumstances may be. You must change them within yourself and around you, then the outside influences will occur. Don’t think too hard about it; just be in the moment by dancing around the room, singing gleefully, and do whatever your heart desires with the purest of intentions. Walk through the doorway into your new existence and it will help mold all of your experiences in a completely different manner. We share this message in this manner, because we feel that it is time to lighten up your load. You have been holding onto too much drama and hurts of the world; it is your time to shine as if everything already happened within you and around you. You are the magician, the alchemist, and the God or the Goddess about to embark upon the greatest adventure of your life. This month is going to prove to be very powerful for each of you. If you take these energies we have shared and put them into your reality, then you will be able to accomplish the tasks at hand as if you were Merlin the Magician himself. You will find that the energies you encounter may be challenging but not insurmountable and you can laugh your way to the next part of your journey. Wesak is right around the corner and the power of the energies are going to be so intense that you are going to need this time to walk into a world that a child dreams about in each moment. Allow your inner children to dance away all the ills and pains that you have endured as you move into a new paradigm of existence once again. Flowing freely is the motto that we want to portray at this moment. 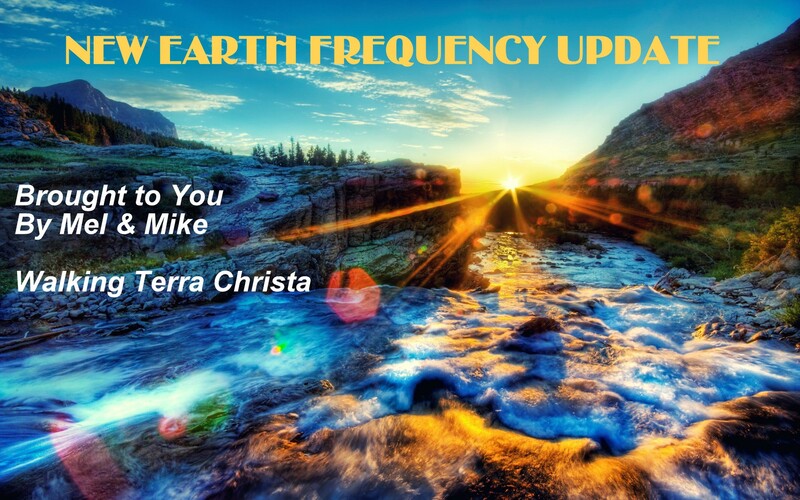 We have asked our messenger, Meleriessee, to take a step back from promoting this Frequency Update as we wanted to see how the energies were enfolding within the planet. We feel everyone needs to be uplifted and shown that all is not falling away as long as you allow yourself to experience life in the highest level of joy and deep passion of the moment. Take time in your moments to reflect this essence we experience and we believe that you will have a new outlook along with being ready to step into a higher existence of yourself. There always needs to be time to reflect, time to work, time to play, and then it creates the pathway to move forward as you receive the depth of courage that is needed for the next stage of the journey. Wesak is going to assist each of you in creating this pathway for yourself and allowing the energies to assist you in the process. It is important to always allow the essence of your Divine Creation to be manifest within your physical creation but that is not always the case. It takes great diligence at times and that energy will be coming forward. We want you to experience your Light as we see it and expand it within you to allow for the full creation of your existence. Take time during this cycle to honor all parts of yourself as you come into a new existence of yourself. It is growing deeply, we see it and honor it with all of our essence combined into the Oneness of the Unified Whole. Blessings and enjoyment for an amazing period of restablization of your light. We Are the Unified Whole Command at your service.